If one were to take a poll of any number of henro, you'd find that the reasons for doing the pilgrimage are as numerous and different as the people that were asked. If i were to indulge my cynicism, i might ask why anyone would want to spend an awful lot of money just to spend two months walking around an island visiting temples whose sole reason for existance is to make money. But, a lot of us end up making just that decision, and the question is, "Why?" I think all of the various reasons can be generalized into two categories: tourism, where the focus is the island's history and culture, and pilgrimage, where the focus is an understanding of the relationship between your self and your existence or, if you happen to be a Buddhist, between yourself and Kōbō Daishi or the many Buddhas and Bodhisattvas worshipped at the temples along the pilgrimage route. The fact is, this is a Japanese pilgrimage and for many that is a part of the mystique. 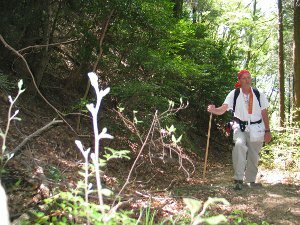 Like myself, there are probably others who never considered doing a pilgrimage anwhere — until they heard of this pilgrimage in Japan. And given their strong interest in 'things Japanese,' and their desire to learn more about Japan, they find themselves deciding to go to Shikoku. When i made that decision before my first walk of the trail in 1999, i went for the historical and cultural lessons involved. 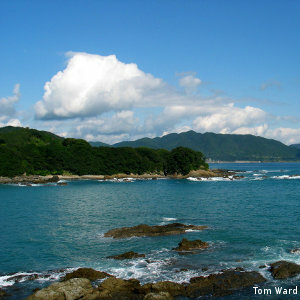 Shikoku remains a rural area of rugged mountains and long sea coasts and its spirit has always been very independent. In early 1185, the Taira retreated to the shores of Sanuki Province (now Kagawa Prefecture) for a very short time while being pursued by the Minamoto. However, they were soon driven out and defeated at Dannoura thus allowing the establishment of the new, Shōgun-led, government in Kamakura. Tosa Province (now Kōchi Prefecture) played a pivotal role in the overthrow of the Tokugawa Shōgunate and the establishment of the new Meiji government in events that have become known as the Meiji Restoration of 1868. Emperors sponsored temples here, prayed here, were exiled here, and were assassinated here. And, as mentioned elsewhere, Kōbō Daishi was born in Sanuki Province in 774 and spent many years on the island - maybe his most formative years. I went to Shikoku mainly as a tourist. Yet, while the history, culture, and beauty of the countryside attracted me, i admit that a part of me found the religious element of this trip intriguing. 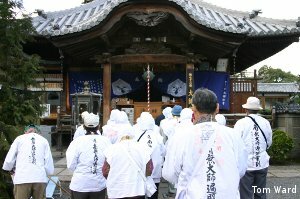 It is said that a hundred thousand Japanese do this pilgrimage every year and the vast majority do so for religious reasons. They may study the history or culture of Shikoku while there, and/or take roll upon roll of photographs (it is fantastically photogenic), but they undertake the trip to ask Kōbō Daishi for his blessings or help. Part of me wondered about this aspect. These people are pilgrims, as opposed to tourists, and go to worship Kōbō Daishi. They go to thank him for success in some endeavor. They go when they retire to thank him for a successful career. They go to ask him for help in overcoming a sickness or disease. They go to ask him for help in overcoming a personal difficuty — at work, school, or in their personal lives. They go to pray for a safe delivery and a healthy baby. They go to pray for good grades on a school entrance exam. As i said, there are as many reasons as there are henro. Some may visit only one temple, or the temples in their local area, but maybe a hundred thousand make the pilgrimage around the entire island. For the serious Shingon Buddhist, and for the serious pilgrim of any (or no) denomination, the pilgrimage is divided into four stages, with your progress through each prefecture representing one stage in your spiritual development. Tokushima Prefecture, from where most people start, represents the stage of awaking the spirit to search for the 'truth.' Kōchi Prefecture symbolizes the stage of subjecting yourself to spiritual discipline. Ehime Prefecture represents the stage of attaining enlightenment. Kagawa Prefecture, the last of the four, symbolizes the stage of entering nirvana. If you go as a tourist, meet as many people as you can. Talk to all who will talk to you (which is almost everybody). Take thousands of pictures. Have fun. Shikoku is a beautiful island and i could easily imagine myself settling down there for the rest of my life. If you go as a pilgrim, meet as many people as you can. Talk to all who will talk to you. Take thousands of pictures. Have fun. But remember why you are there. Many of the scholars who write about pilgrimages write about liminal experiences. Victor Turner points out that liminality is as much about potentiality as about thresholds. Liminal experiences are about both discovering your true potential and experiencing that threshold state you must progress through to get there. 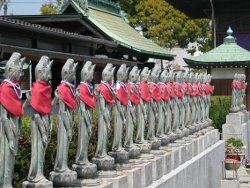 Shikoku, like other pilgrimages around the world, offers the possibility of coming to understand both. When and where each pilgrim finds his/her threshold is different. What they find on the other side may also vary, but it is certain that you can only find it if you remember that during each and every day, each and every minute, each and every step, each and every breath, you are on a path of discovery. Enjoy yourself but don't lose your focus. I would be remiss, however, not to point out that, while the people of Shikoku will always be there to offer assistance when you want or need it, and while the temple buildings themselves are always there for your worship (free of charge), the temple personnel are not there to help. Most of the temples are closed to the public (at least the non-paying public) and the only people you will meet are the one or two who are there to sign and stamp your stamp book. Unless you are part of a large, paying, bus group, the temple priest will have nothing to do with you and the temples are little more than mile markers on your journey. By the end of my 1999 trip around the island i had come to understand both the truth of this point and the complete triviality of it. Yes, the temples are mile markers and little else. But, the pilgrimage, in the truest sense of the word, is not about the temples, nor the priests who work there, nor the statues inside. The pilgrimage is about you — about what you bring to the henro trail when you get there, about what you give up and lose along the trail from day to day, and about finding your potential through the process of shedding the various layers of who you think you are. It was with this in mind that i walked the trail again over four years between 2005 and 2008. In the end, though, the short answer to "Why should i go?" is easy. Go as a tourist. Go as a historian. Go as a photographer. Go just to collect the stamps because you believe they bring good luck. Go as a pilgrim. For whatever reason you decide to go, for whichever hat you decide to wear, you won't be disappointed.